Inquisitors in the Middle Ages believed they could easily tell the difference between orthodox believers and heretics. They wrote manuals that described the beliefs and practices of heretical groups, devising questions designed to ferret out the fifth columnists hiding dangerously and threateningly in their midst. Heretics were the enemy within, the rotten apples in the religious barrel. It was essential to sort the sheep from the goats, in order to sustain the social and ecclesiastical order. But were heretics and faithful Christians really so very unlike? Louisa Burnham argues that historians have been too anxious to make simplistic distinctions between heresy and canonical orthodoxy. She contends that heretics were part of a complex movement that was as deeply spiritual as that of their enemies.Far from existing at the margins of popular religious life, heresy was central to the medieval Church’s attempt to define itself.Examining in turn some of the key heretical movements of the period (such as the Cathars, Waldensians, Beguins, Lollards, Wycliffites and Hussites), this bold and original textbook shows students and teachers of medieval history that there was a fine line between heresy and orthodoxy: and that, apart from circumstance, the distinction made between sinner and saint might often have been very different. In Defining Heresy, Irene Bueno investigates the theories and practices of anti-heretical repression in the first half of the fourteenth century, focusing on the figure of Jacques Fournier/Benedict XII (c.1284-1342). Throughout his career as a bishop-inquisitor in Languedoc, theologian, and, eventually, pope at Avignon, Fournier made a multi-faceted contribution to the fight against religious dissent. Making use of judicial, theological, and diplomatic sources, the book sheds light on the multiplicity of methods, discourses, and textual practices mobilized to define the bounds of heresy at the end of the Middle Ages. The integration of these commonly unrelated areas of evidence reveals the intellectual and political pressures that inflected the repression of heretics and dissidents in the peculiar context of the Avignon papacy. Dramatic political events involving Muslims across the world have put Islam under increased scrutiny. However, the focus of this attention is generally limited to the political realm and often even further confined by constrictive views of Islamism narrowed down to its most extremist exponents. Much less attention is paid to the parallel development of more liberal alternative Islamic discourses. The final decades of the twentieth-century has also seen the emergence of a Muslim intelligentsia exploring new and creative ways of engaging with the Islamic heritage. Drawing on advances made in the Western human sciences and understanding Islam in comprehensive terms as a civilisation rather than restricting it to religion in a conventional sense their ideas often cause controversy, even inviting accusations of heresy. Cosmopolitans and Heretics examines three of these new Muslim intellectuals who combine a solid grounding in the Islamic tradition with an equally intimate familiarity with the latest achievements of Western scholarship in religion. This cosmopolitan attitude challenges existing stereotypes and makes these thinkers difficult to categorise. Underscoring the global dimensions of new Muslim intellectualism, Kersten analyses contributions to contemporary Islamic thought of the late Nurcholish Madjid, Indonesia’s most prominent public intellectual of recent decades, Hasan Hanafi, one of the leading philosophers in Egypt, and the influential French-Algerian historian of Islam Mohammed Arkoun. Emphasising their importance for the rethinking of the study of Islam as a field of academic inquiry, this is the first book of its kind and a welcome addition to the intellectual history of the modern Muslim world. 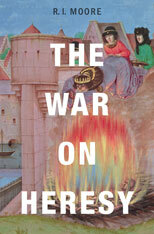 A fascinating looking book by the medievalist R.I. Moore (Newcastle) will be published in April, The War on Heresy (Harvard 2012). Religious heresy is in some ways the ancestor (though a still-living ancestor) of religious dissent, and so it may be interesting to reflect on how the history in this volume might shed light on contemporary concerns. The publisher’s description follows. Between 1000 and 1250, the Catholic Church confronted the threat of heresy with increasing force. Some of the most portentous events in medieval history—the Cathar crusade, the persecution and mass burnings of heretics, the papal inquisition established to identify and suppress beliefs that departed from the true religion—date from this period. Fear of heresy molded European society for the rest of the Middle Ages and beyond, and violent persecutions of the accused left an indelible mark. Yet, as R. I. Moore suggests, the version of these events that has come down to us may be more propaganda than historical reality. Popular accounts of heretical events, most notably the Cathar crusade, are derived from thirteenth-century inquisitors who saw organized heretical movements as a threat to society. Skeptical of the reliability of their reports, Moore reaches back to earlier contemporaneous sources, where he learns a startling truth: no coherent opposition to Catholicism, outside the Church itself, existed. The Cathars turn out to be a mythical construction, and religious difference does not explain the origins of battles against heretic practices and beliefs. A truer explanation lies in conflicts among elites—both secular and religious—who used the specter of heresy to extend their political and cultural authority and silence opposition. By focusing on the motives, anxieties, and interests of those who waged war on heresy, Moore’s narrative reveals that early heretics may have died for their faith, but it was not because of their faith that they were put to death.